Suzuki has never sold a pickup in the US, but the new Equator will expand it truck lineup beyond SUVs. Based on the Nissan Frontier midsize truck, the Equator features more aggressive styling to distinguish it from its platform mate. The standard 152-bhp 2.5L I-4 can be replaced with a 261-bhp 4.0L V-6. Both engines are available with a 5-speed automatic, while the 2.5L can be equipped with a 5-speed manual. For serious off-road capability, the Equator is available with front and rear limited-slip differentials, Vehicle Dynamic Control, hill descent control, and hill start assist. The Equator is available with 16 or 17-inch wheels shod with 265/75R16 or 265/65R17 tires. 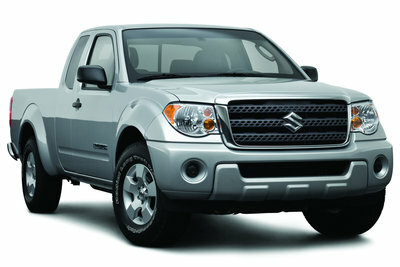 Suzuki offers the Equator in Extended Cab and Crew Cab models. Maximum towing capacity is 6,500 lbs. Available options include heated leather seats, moonroof, Rockford Fosgate audio system, and Bluetooth phone system.